My planning notes on this one say “summery” along with a list of rich, warm color combinations. I studied summer scenes and came up with a combination of colors to suggest ripeness and heat. I also wanted to do the view of Vancouver from Queen Elizabeth Park showing dense foliage and snow-free mountains. Somewhere along the way, I also started thinking about van Gogh’s sunflowers and William Blake’s “Ah! Sunflower” poem about longing, which is a constant feeling many of us have here given the real estate prices: we wish this was the view from our back yard. Mostly, I wanted to get more golds and yellows into the picture so I added the row of giant sunflowers at the bottom. 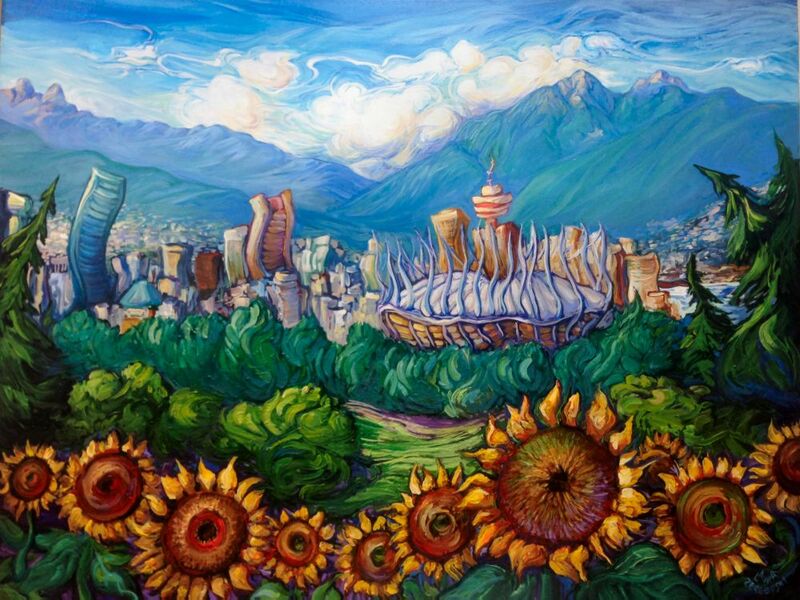 These are modeled on van Gogh’s sunflower series but I liked how they allude to the sunflowery-ness of BC Place. I started referring to the painting as “van Gogh ‘Couver” in my head and I ended up using three van Gogh paintings as references for specific brushstrokes and tones. Vancouver is one of those stable climates where “summer” is usually an intense two-week period wishing for air conditioning before the climate reverts back to cool and rain. Luckily, in the nearby Fraser Valley, summer lasts a lot longer and we get the benefits of the locally grown produce. Sunflowers are symbolic, too. The sunflower is the quintessential summer flower but also an internationally recognized symbol of Green politics, which suits Vancouver. The way sunflowers turn their faces to follow the sun reminds me even more of Vancouver.